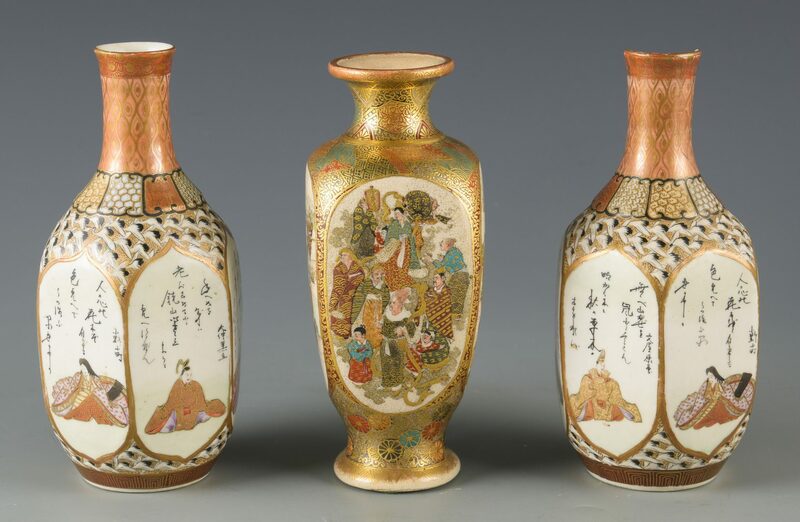 1st item: Satsuma footed bud vase with four faceted sides depicting two scenes of courtiers or deities, a battle scene, and a scene before a country house. Remnants of gold seal mark on base. 6 1/8" H x 2 3/8" W. Late 19th/early 20th century. 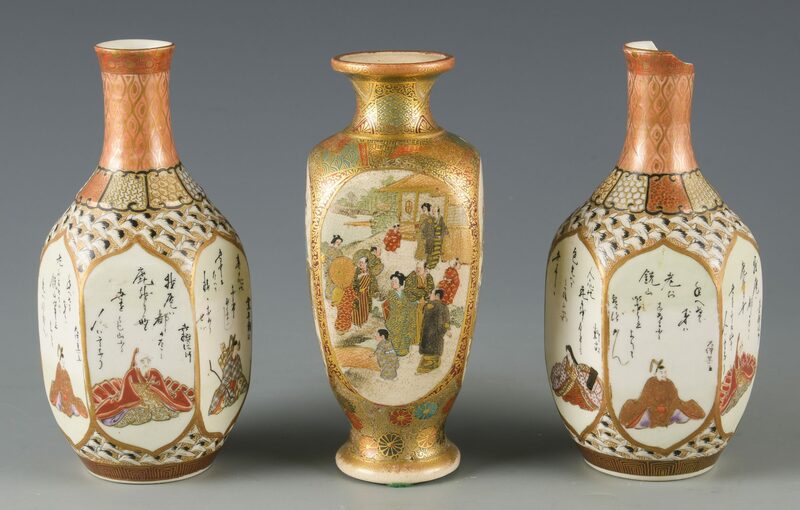 2nd-5th items: Two pairs of Satsuma footed bud vases, one larger pair with a group of people in a landscape setting, one smaller pair with two birds in a bamboo grove. Larger pair with black and gold seal marks to base, smaller pair with red seal marks to base. 3 5/8" H x 2 1/4" W to 4 3/4" H x 2 3/8" W. Late 19th/early 20th century. 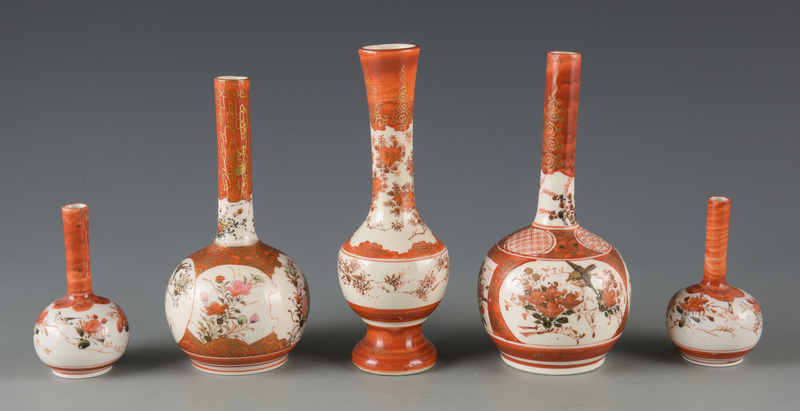 6th-10th items: Five Kutani bottle vases having elongated necks with foliate, insect, and bird decorations, one with footed base. Bases of four signed with red character marks, one with remnants of retail tag. 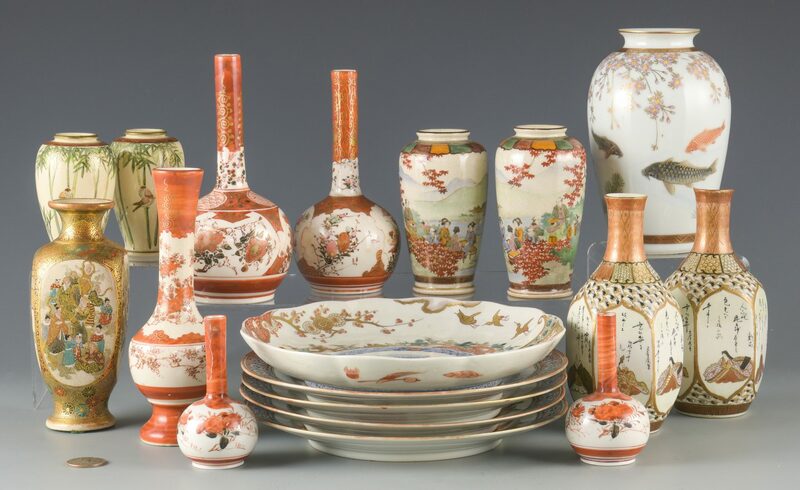 Ranging in size from 3 3/4" H x 2 1/8" W to 7 1/8" H x 2 1/2" W. Late 19th/early 20th century. 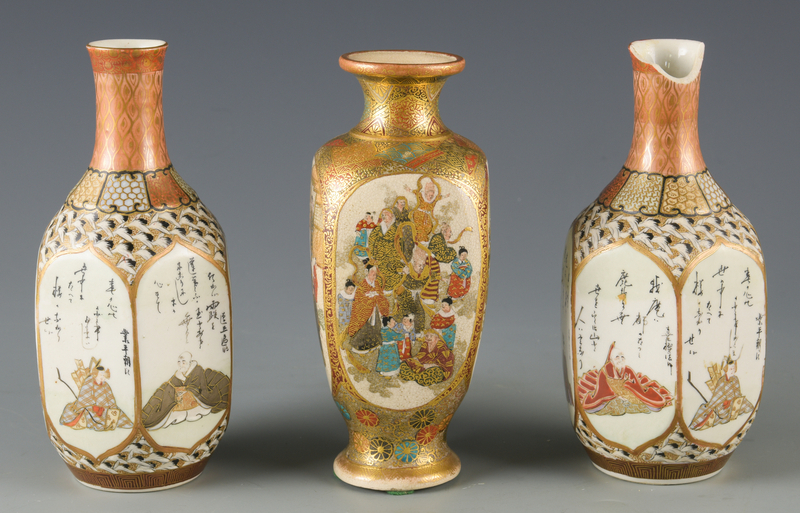 11th-12th items: Pair of Satsuma bottle vases with six faceted sides depicting six of the "Seven Lucky Gods" with black character marks and repeated flying cranes above and below vignettes. Base signed with red character marks. 6 1/4" H x 2 3/4" W. Late 19th/early 20th century. 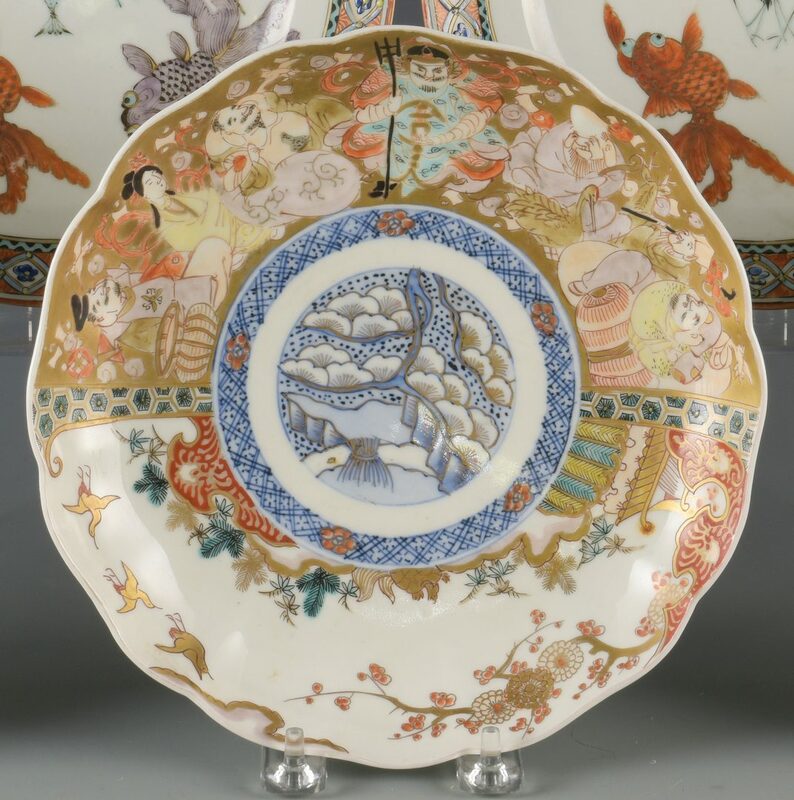 13th item: Imari porcelain plate with scalloped rim featuring the "Seven Lucky Gods", images of feathers and bowls, outside rim, with 1/8" foot. Unmarked. 1/4" H x 8 1/2" W. Late 19th/early 20th century. 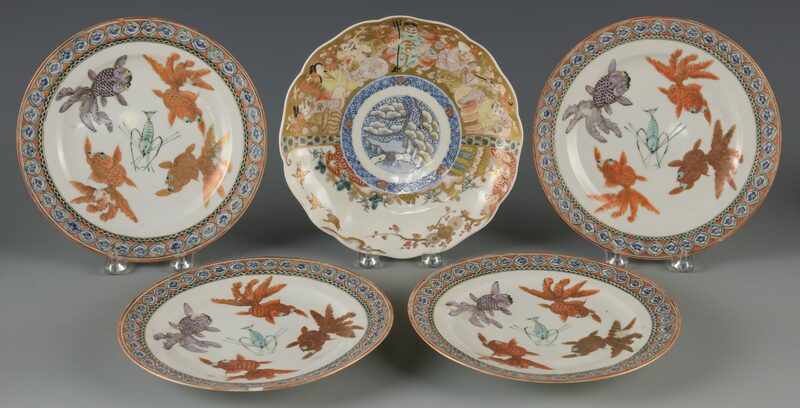 14th-17th items: Four Chinese export porcelain plates in the Japanese style featuring four goldfish and a lobster. Stamped "MADE IN CHINA" underside of plate. 1" H x 8 1/2" W. 20th century. 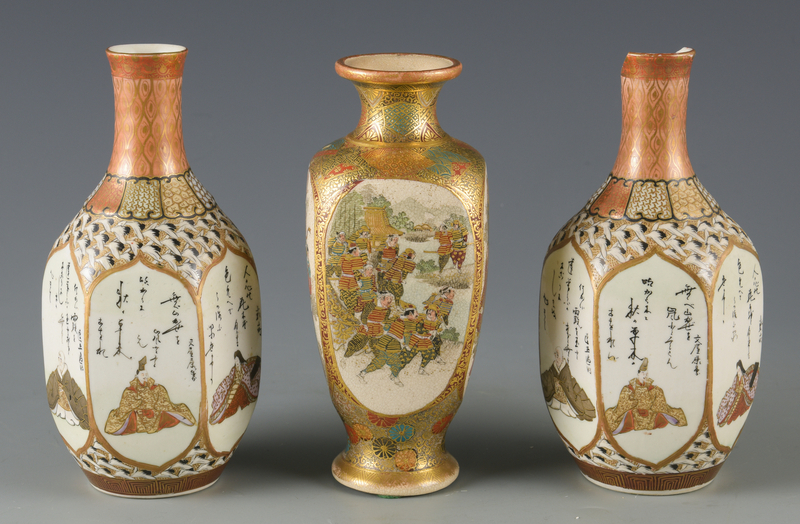 18th item: Kutani style bud vase with koi fish and foliate decorations. Four red character marks, lower right of decorations on body. 6 3/8" H x 3 7/8" W. 20th century. Provenance: Private Knoxville, TN collection. CONDITION: 1st item: Very good condition with some sticker residue, underside of base. 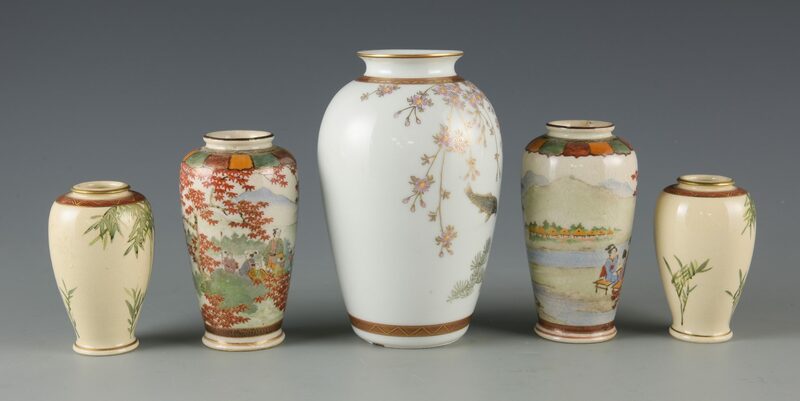 2nd-5th items: Very good condition with some sticker residue, surfaces of smaller vases. 6th-10th items: Some scratching to designs, largest 7/8", surface of bottles. Overall craquelure, surface of footed bottle. 11th-12th items: 1/8" break, rim of one bottle. Surface grime, visible on bottles. 13th item: Areas of loss to glaze, largest 1/8", outside rim. Minute scratches, surface of plate. 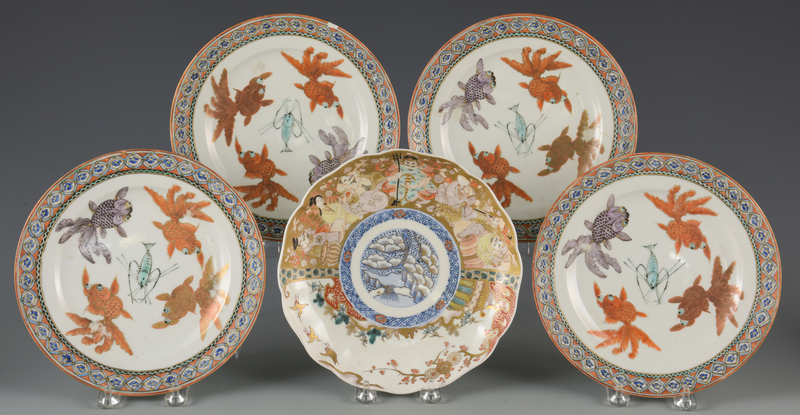 24th-17th items: Areas of fading to designs, largest 5/8", surface of plate. 3 3/8" area of ghost tape marks, surface of one plate. 1/2" chip, rim of one plate. Areas of surface grime, largest 1", surface of plates. 18th item: Black scuffs, largest 2", surface of vase.